Through the years, I've collected a number of flash drives. Sometimes I will attend a writers' conference and all of the sessions (even those I miss) are sold on a flash drive. 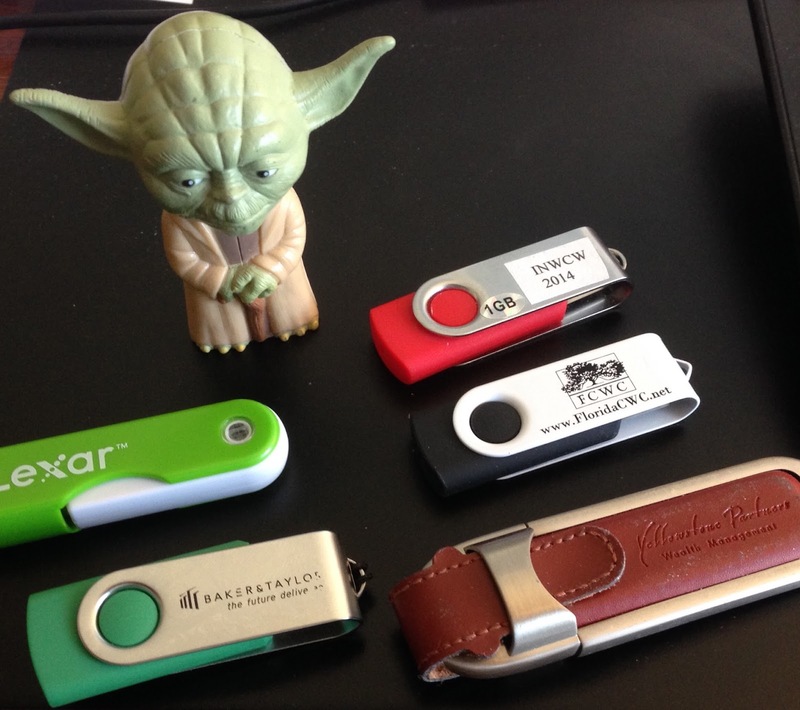 Often these flash drives will pile up in my desk drawer. How do I find the time to listen to this material? In May I taught on the faculty and they offered the entire conference without cost. I know these audio files contain valuable teaching insights for every writer. The files came as an online download and I put them in a folder with the conference name on a flash drive. Because I used the flash drive, these files are portable and don't fill my main computer. In the past, I've mentioned about using the Bluetooth feature of my car audio and listening to audio books. My car has a USB connection on the dashboard that until recently I had never used. With the flash drive which contained the audios from the writers' conference, I turned on my car and plugged it into the port. Touching the “files” on my dashboard, I saw all of the audio MP3 files from the flash drive. Last weekend, I drove 45 minutes to an hour to a writers' meeting in Colorado Springs. Instead of listening to an audio book, I listened to several teaching files from the flash drive. Steve Laube, founder of The Steve Laube Agency, taught a workshop titled, “Do I Need a Literary Agent?” While much of the information was familiar, I enjoyed hearing Steve's stories and insights on the audio file. My time in the car passed quickly and I was learning from my flash drive. Also I heard another literary agent, David Van Diest, teach on the elements of a book proposal. While I have a bestselling book on this topic called Book Proposals That $ell, there is always more to learn on this subject from this seasoned publishing colleague. David has worked in marketing and other aspects inside publishers as well as run his own agency for many years. To be honest, I have many more hours of teaching to catch on these audio files. Instead of never hearing them or leaving them stuck in my desk, through using the flash drive, these files are actively on my car audio system. Whether I'm driving a long distance or only across town, I can grab a few more minutes of writing instruction. Through this experience, I've been reminded of a simple principle: There Are Many Different Ways to Learn Information. Some of us learn best through reading. Others learn through actually doing while still others are audio learners. You probably have some of these audio files on your computer. Can you transfer them to a flash drive then begin listening to this instruction in your car? Getting the information is the first step, then apply the information to your own writing life.